Good morning and welcome to Varengold’s Daily FX Report. Today we expect further interesting economic data from Europe and the United States and of course the ECB rate decision. However, we wish you good luck and a successful trading day. The JPY continued its weekly bearish trend and weakened for the third day versus the EUR on speculation that the ECB will announce plans to scale back emergency lending while keeping borrow costs low at its today’s meeting. Economists expect that the ECB will left its key interest rate at 100bps and estimate also that the European retail sales declined at a slower pace. The USD/JPY rose on Wednesday to 87.49 at its highest level after the Fed said in its Beige Book business survey the economy expanded or improved “modestly” across the U.S. from October to mid-November as consumer spending rose in majority of Federal Reserve districts. Australia’s retail sales strengthened 0.3 percent in October, rebounding from an unexpected decline in the previous month and pushed the AUD/USD to 0.9310 at its highest level during the Asia session. After the NZD/USD recovered from its yesterday’s losses in the early Tokyo trading hours and climbed to 0.7280 a drop in the national consumer confidence put pressure on the NZD again. 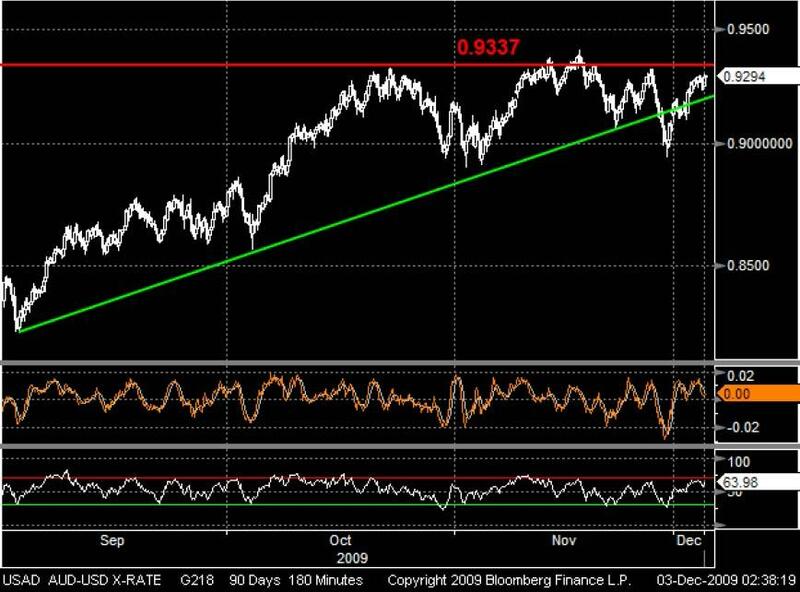 The AUD/USD traded during the fourth quarter 2009 close to a bullish trend-line with only one short exception at the end of November. Now the currency pair is back above the trend-line and aimed its resistance at 0.9337 again. The RSI shows an overbought market and also the Momentum indicator tumbled. If the AUD couldn’t break through the resistance we have to allow for a trend reversal. During the last months Gold scaled nearly daily for new all-time highs and it seems that the trend will go on. 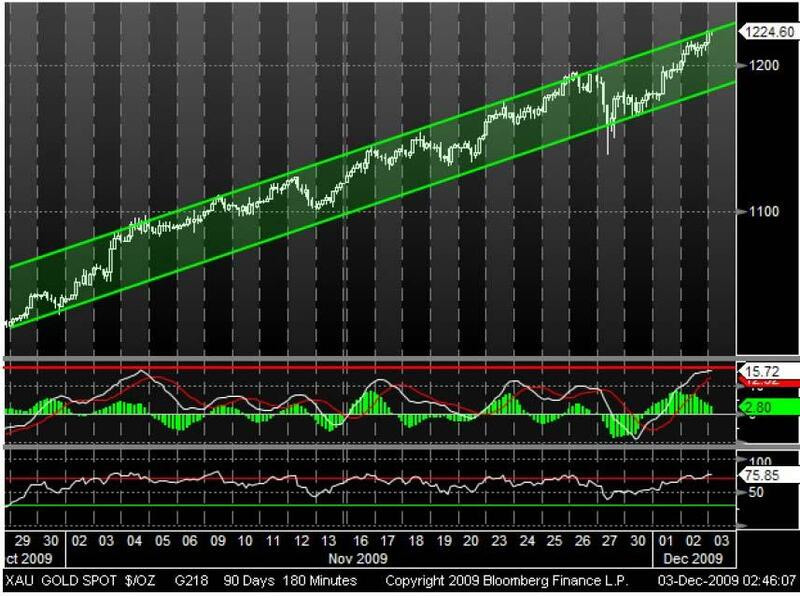 But at first the metal touched its upper trend-channel-line and in considering of a overbought market as shown by the RSI we have to allow for some profit takings. Also the MA Oscillator reached its resistance and may indicate that the bullish rally will take a short pause.